If you are a visitor to the twin-cities state of Minnesota, plan a unique ghost-hunting adventure and stay at one of Minnesota's haunted hotels. And if you are a resident of Minnesota, get to know your state's spookier side and embark on an exploration of the unexplainable and visit one of Minnesota's very own haunted hotels. 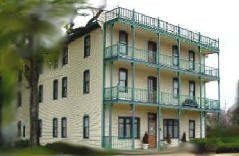 One of its most haunted hotel is the Palmer House Hotel in Sauk Centre. Rated as Minnesota’s most haunted hotel, the Palmer House Hotel warmly welcomes their ghost-seeking guests bent on having a good spooky stay. The Palmer House is an historic hotel originally built in 1901 by Ralph L. Palmer after a fire ravaged the existing building in 1900. The hotel is located about an hour and a half northwest of Minneapolis in the small town of Sauk Centre - hometown of the first American writer to win the Nobel Prize in Literature, Sinclair Lewis. But enough about writers and Nobel prizes, let’s move on to the ghosts and haunted stuff! There have been so many reports of paranormal activity at the Palmer House Hotel (wayyyyyy to much to report here) that they’ve dedicated a page on their website (http://www.thepalmerhousehotel.com/palmerhaunt.html) to document it all. These numerous accounts from guests and experts alike prove that indeed, ghosts rule at the Palmer House! And with the hotel’s permission (and consent forms) you can even arrange a formal paranormal investigation of your own! It is recommended that if you plan on staying at the Palmer House and want to increase your odds of experiencing a ghost, you should request to stay in either room 17 or room 11. The Palmer House Hotel has been featured in the Minnesota Monthly as well the Travel Channel’s Ghost Adventures. 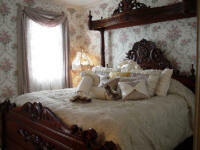 Thayer’s Historic B & B sure seem to be one of the friendliest bed & breakfasts around! They are people-friendly, cat-friendly, and even ghost-friendly. They really seem to have a good ‘old time over there at Thayer’s. Located in Annandale, Minnesota, Thayer’s is about 60 miles northwest of Minneapolis. Thayer's was built in 1895 by Gus and Caroline Thayer and they say both Gus and Caroline still visit often - well, at least in the form of spirits! Gus has been known to leave pennies for the owners or staff to find. A number of other ghostly guests from the other side are reported to visit on a regular basis as well. Ghost Kitty - was the first of our kitties from the other side to introduce himself. He likes to sit on your bed and he leaves an indentation where he has been. Some of our guests have seen him in the living room. Thayer’s is proud to announce they are listed in another new book! Chad Lewis' 'Haunted Locations in Minnesota' It's a travel guide. They are also in A Ghost in My Suitcase by Mitchell Whittington, also a travel guide. Both books have some fun stories and great locations to visit.